Like many other subcultures, the world of reclaimed wood is rife with arcane technical terms and mysterious jargon. To help clients cut through the clutter and better understand the terminology, we've assembled this glossary of common terms. Let us know if there's anything we should add to the list. Back Relieved: Channels milled into the back or bottom face of the material to help reduce nail blow-out during installation and reduce cupping after installation. Bow: A 'flatwise deviation' in a straight line drawn from end to end of a piece. A curvature from end to end as in the rails of a rocking chair. Brine Staining: Coloration and/or streaking from the olive or pickle making process. Bevel: When the edges of the material are milled at an angle to compensate for slight variations in thickness between pieces. Most commonly associated with prefinished flooring, siding and paneling where the material is not able to be sanded smooth after installation. Character Grade: Material that can include occasional to frequent character. This character may include knots, nail holes, checking, etc. Checking: Cracks or fissures that appear on the surfaces of lumber during drying. These checks can sometimes deepen and intersect the full thichness of the material. Surface checks do not significantly degrade the wood's structural integrity. Deeper checks can do that. Circle-Sawn: Surface texture created by a circular saw blade. Commonly associated with material that was originally milled in the 19th and early 20th centuries. 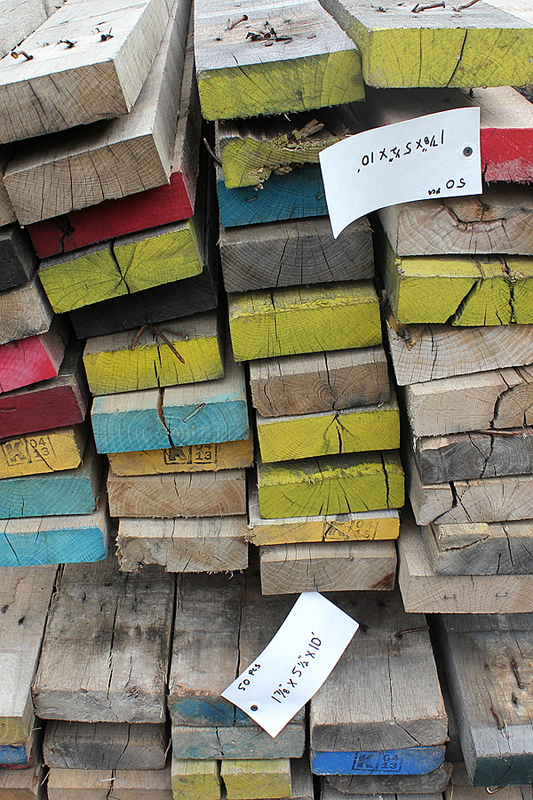 Color Tones: The range of colors inherent in the wood. All wood ranges in color, e.g. "tans and khakis with muted light-to-darker browns. With contrasting black fill". Crook: A 'lengthwise deviation' in a straight line drawn from one end of a piece to the other. A curvature from end to end similar to that of a boomerang (though rarely that extreme). Cup: A flatwise deviation in a straight line drawn from one edge of a piece to the other. A curvature from edge to edge similar to that of rain gutter (though rarely that extreme). Deep Checking: More than 1/4" wide and/or 10" long. E4E: Eased Four Edges. Material with eased/rounded edges on all four sides. End-Matched: Material with a tongue & groove profile on the ends so that the ends of the material slot into place. Fastener, Nail & Spike Holes: Holes produced by extracted or missing nails, spikes, screws, bolts and other fasteners used during the wood's prior life as part of a barn, bridge, etc. Fill: A liquid epoxy or paste compound used to fill pores, checks, nail holes, insect bore holes and other holes and voids in the wood. Insect Bore Holes: Holes or trails left by insects in the previous life of the wood. (Kiln drying kills any living insects that may exist in the wood prior to milling). Loose Knots: Knots which are not firmly fixed in place. Micro-Bevel: When the edges of the material are milled at a very slight angle to compensate for minor variations in thickness between pieces. Most commonly associated with prefinished flooring where the surface of the material is not able to be sanded smooth in place after installation. Missing Knots: Voids created by loose knots dropping out of the wood. Mixed Grain: Material that includes both flat and vertical grain. Moisture Content: The amount of moisture in a piece of lumber. Expressed as a percentage of the material's weight consisting of water. Mortise Pockets: A hole cut into a timber to receive the tenon of another piece to hold it in place. This can be left unfilled or filled with wood and glued in place. Naturally Distressed: Characterized by heavy surface texture, color variation, checking and other signs of prior use and age created during the material's previous existence as part of a barn, bridge, etc. Oxide Stains: Dark coloration or streaking created by rusting nails and other agents in, or adjacent to, the wood. This discoloration may be in streaks, patches or irregular areas. Prefilled: Products with nail holes, checks and other voids that are filled with epoxy, wood and/or other material. For example, bolt holes prefilled with wood plugs. Premium Grade: Includes prefilled nail and other holes but does not include mortise pockets, limited insect bore holes, sapwood and knots. Profile: The milled pattern along the edges of a piece. Common profiles include 'plank' and 'tongue-and-groove'. Reveal: A channel or trough created by overlapping material most commonly found in siding applications. RS3S: Rough-Sawn Three Sides. Material that is rough sawn on both edges and the bottom face with the surface left intact to show the wood's naturally weathered face. RS4S: Rough-Sawn Four Sides. Material that is rough sawn on all four sides. S3S: Surfaced Three Sides. Material that is surfaced smooth on the edges and bottom face with the surface left intact to show the wood's naturally weathered face. S4S: Surfaced Four Sides. Material that is surfaced smooth on all four sides. Sapwood: The outer layers of growth between the bark and heartwood that contain the sap. Often lighter in color than the heartwood. Typically softer and not as structurally sound or durable as the heartwood. Saw Marks/Scarring: Marks left from original milling of lumber or marks from previous use. Seasoned Checking: A separation of the wood normally occurring across or through the annual rings and usually as a result of seasoning. Select Grade: Includes nail and other holes and voids - all prefilled by hand with teak and/or epoxy. Shake: A lengthwise separation of the wood which occurs between or through the rings of annual growth. Surface Checking: Fine, shallow cracks appearing on the surface of a material or in a film of surface coating. Also known as check cracks. T&G Profile: A tongue-and-grooved piece of lumber. Tight Knots: So fixed by growth, shape or position that it retains its place in the piece. Twist: A combination of flatwise and/or lengthwise and/or edgewise deviation from one end of a piece to the other. Vertical Grain: Material that was milled/sawn at approximately right angles to the annual growth rings of the wood, so that the rings form an angle of 45 degrees or more with the surface of the piece. The surface grain of this material appears as narrow, straight lines. V-Groove: A shallow, V-shaped channel created by adjoining two pieces with beveled edges. Most commonly found with paneling applications. Wine Staining: Coloration and/or streaking from the wine making process. This coloration varies depending on the type of wine originally stored in the wood tank, e.g. white, red, etc.